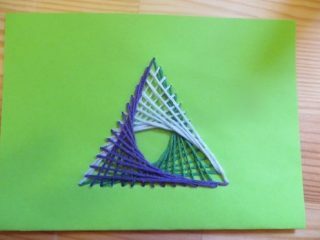 This gives instructions about how to make a string art postcard or card. This was inspired by Karen’s postcard project. These are made by Fred Mindlin from card and coloured thread. They would make lovely Xmas tree decs as well. This work by Sarah Honeychurch is licensed under a Creative Commons Attribution-NonCommercial-ShareAlike 4.0 International License.